In Romans 11:17-18, Paul likens God's Church to a God-planted and God-tended olive tree. Some branches, that is non-believers, are pruned, while shoots of wild olives, meaning gentile Christians are grafted in. The grafted-in symbol was discovered recently on pottery on Mt. Zion, in a 2nd century A.D. assembly room. It illustrates that Jew and gentile belong together and are one in the Messiah. 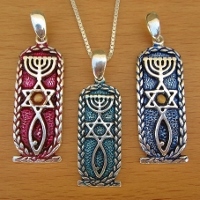 The triangular base of the Menorah, which symbolizes God's Torah, and the triangular tail of the Fish, a symbol of Jesus and Christianity, interlace to create the Star of David. In some of our designs, the grafted-in emblem is embedded in a cartouche (which is an Egyptian emblem symbolizing long life, good luck, and protection from evil) to emphasize the significant role of Egypt in the Bible. An olive tree and “Rom. 11:17” are inscribed on the back of the cartouche.